Reno Omokri had angered a twitter user when he posted on how 'artificial' the world is today, here is what he wrote. "There is enough artificiality in this world today. Artificial hair, nails, eye colour, lashes, bosoms, backsides, complexions etc. So when you see a real girl with real hair, eyes, lashes and attitude, value her. 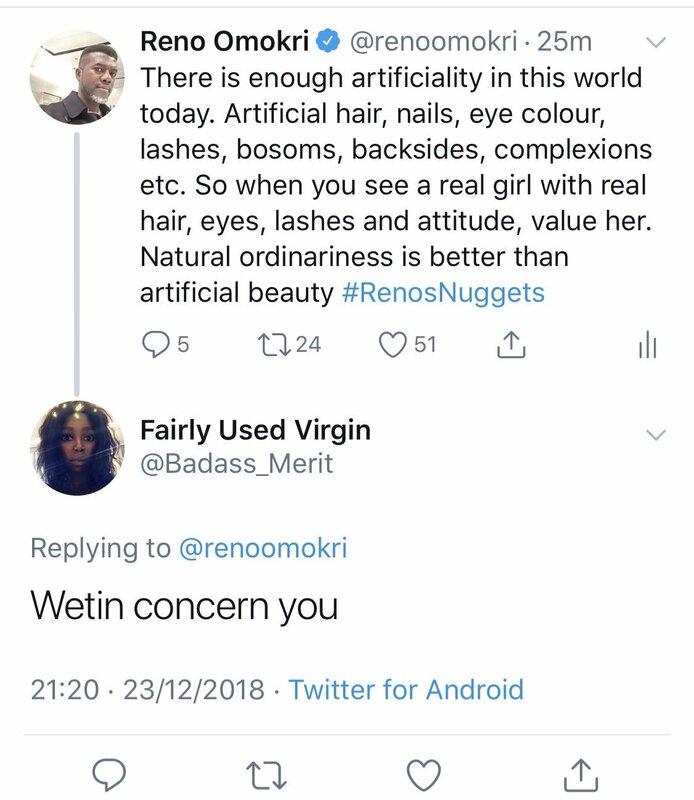 Natural ordinariness is better than artificial beauty"
The Twitter user with handle @Badass_merit 'Fairly Used Virgin' replied him with this "Wetin Concern You"
"I understand your distress. A frog is always upset when big eyes are mentioned in a conversation. Your profile name, ‘Fairly Used Virgin’, speaks volumes!"